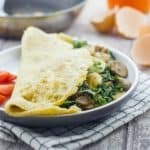 Spinach mushroom omelette – learn how to make the perfect omelette with sliced mushrooms, mild seasoning and spinach to boost iron levels. 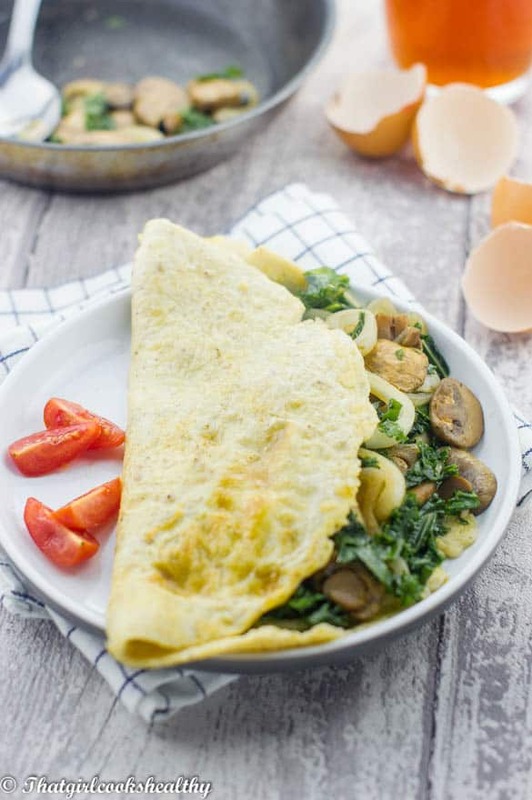 This spinach mushroom omelette is usually what I ingest during the weekday because it’s filling, quick and convenient for my busy mornings. 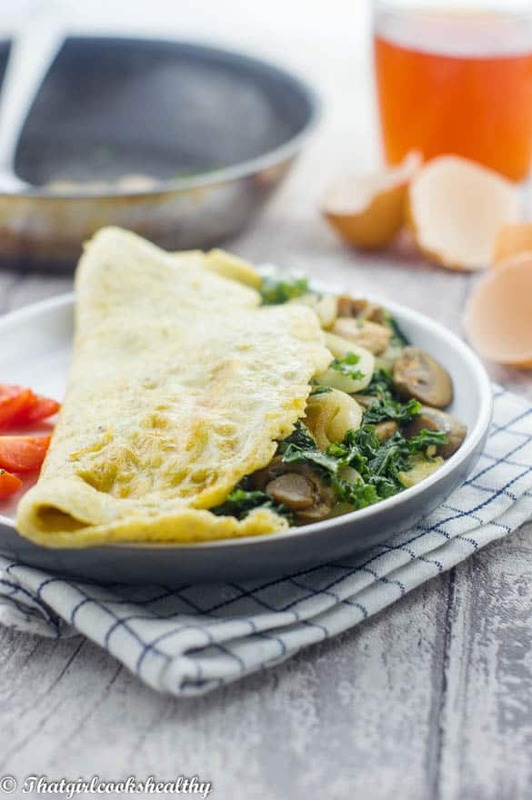 It’s packed with protein, spinach – high in vitamin B and iron and the mushrooms provide me with fat soluble vitamin D which is perfect for a woman who lives in a colder climate. 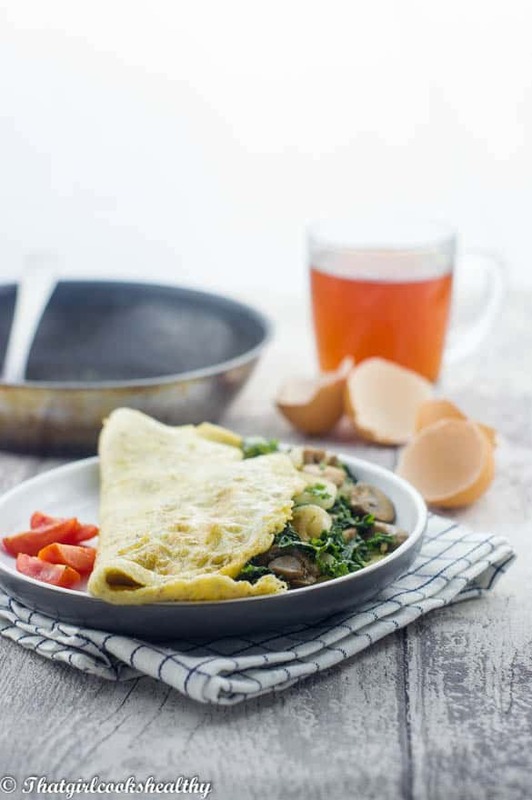 I often feel energised and full when I eat this omelette and this is attributed to all the essential vitamins and minerals procured in one serving. It’s not surprising that I can last until midday before needing another bite to eat, oh sorry I should have mentioned that I consume this about 7:45am in the morning. Still not convinced? I dare you to try this recipe. 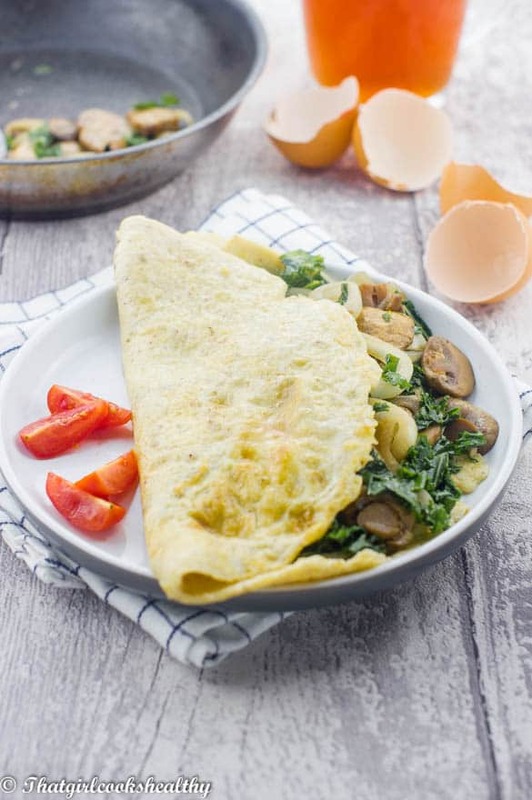 What is interesting about this spinach mushroom omelette recipe is how I managed to infuse my secret ingredient – garam malasa, an Indian spice which really enhances the flavour as well as black pepper and chives for additional seasoning. Once the eggs are whisked, and then proceeded to sautee the onions in a frying pan. It might be advisable to sautee the onions for 1 minute prior to adding the mushrooms to avoid overwilting. 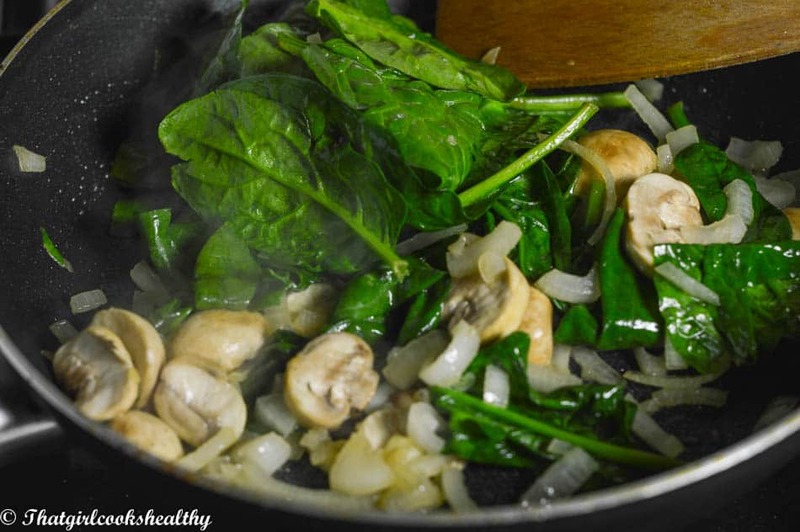 When incorporating the spinach, make sure to remove ingredients from the pan once the spinach starts to wilt. Feel free to add some more vegetables like broccoli, carrots etc..
Whisk the eggs, garam masala, black pepper, salt, chives and set aside. 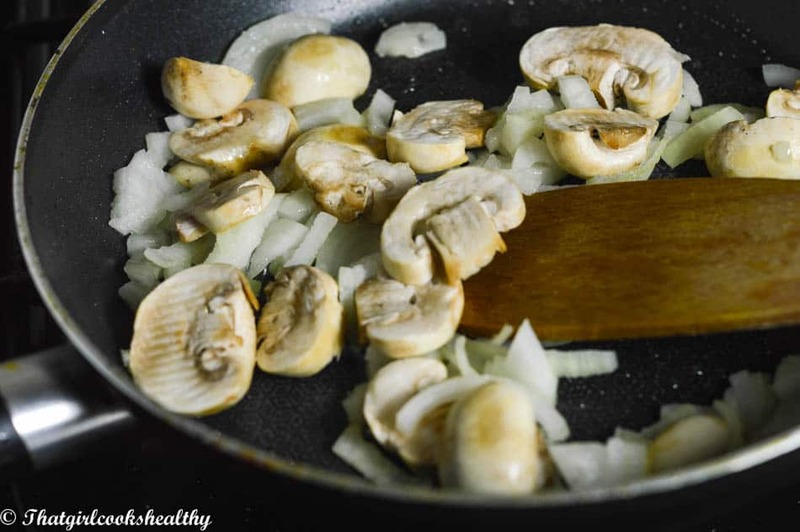 In a small frying pan with 1tbsp of olive oil, under medium heat, add the onions and sautee for 1 minute, then add the mushrooms and cook until lightly golden. Under medium heat, add olive oil and pour the egg mixture into the frying pan. Cook the omelette until slightly brown, check the readiness by using an egg spatula to lift the side of the omelette and tilt so the egg runs over the sides. On one half of the omelette layer with the mushrooms, spinach and onions. Fold over the other half onto the vegetables and cook for another 2 minutes until the omelette is slight pale yellow in colour. Thank you! I hope you do try this recipe, it’s yummy!